While searching the fenced-in pond at Loantaka Brook Reservation early this morning for shorebirds (there are none), an adult Little Blue Heron flew into the pond in close proximity to the continuing male and female Blue-winged Teal. Ruby-crowned Kinglets, Pine, Palm and Yellow-rumped Warblers were in the trees near the pond. Little Blue Heron is a rare visitor to Morris County with one or two sightings per year, if at all (J. Klizas). This morning, a Vesper Sparrow was at Wagner Arboretum (west side of Glenhurst Meadows) where the old barn used to be. Also, 3 Blue-winged Teal and 18 Green-winged Teal, 4 Broad-winged Hawks, 4 Red-headed Woodpeckers, 4 American Kestrels, 1 Merlin, 9 Blue-gray Gnatcatchers, 4 Ruby-crowned Kinglets, 25 Palm, 2 Pine and 20 Yellow-rumped Warblers, 6 Field and 6 Savannah Sparrows (Jeff Ellerbusch). Bald Eagle in Hanover Twp. Bald Eagle, Hanover Twp., NJ, Apr. 12, 2014 (photo by Chuck Hantis). The spring Broad-winged Hawk season in Morris County began yesterday, Apr. 12, with 19 tallied at the Wildcat Ridge hawk watch in Rockaway Township. Purple Martins are back at the Verizon Pond off of South Maple Avenue, Basking Ridge (J. Ellerbusch). 3 Pectoral Sandpipers continue at Opie Road, Branchburg Twp. (David Bernstein). 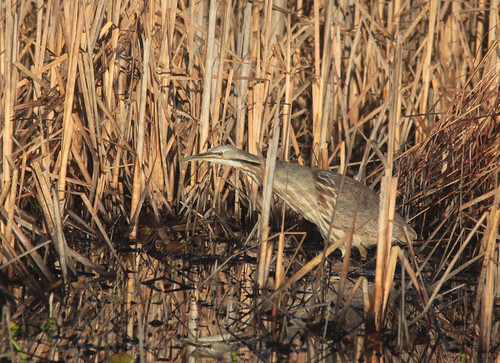 American Bittern at Great Swamp NWR, Apr. 12, 2014 (photo by Tom Smith). Hermit Thrush, Rockaway Twp. NJ, Apr. 13, 2014 (photo by J. Klizas). This entry was posted in Morris County, Somerset County and tagged Bald Eagle, birding, birds, migration, mocosocobirds, Morris County, nature, ornithology, Photography, somerset county. Bookmark the permalink. The Little Blue Heron was still at Loantaka Brook at 11:00 this morning 4/14 along with the two Blue-winged Teal, two Wood Ducks, and a Palm Warbler.